There are a lot of things going on in this big world, some awesome and some devastating. One of the ways I’m going about actually seeing the devastating things is seeking out ways to help. I can feel so helpless, so hopeless, when given numbers and data and statistics. Thousands of men, women and children living the realities of slavery right now today in 2015. Thousands of refugees displaced and unsteady. Thousands of starving babies. Thousands of sick people who could be cured with the right medicine. Tens of boys now without an income because washing windshields has been made illegal in Boca Chica. When we look at the numbers, the data, and the statistics, it’s easier to be numb than compassionate. It’s easier to settle into our comfy lives than take action. It’s hard to know where to start. So every month, on the 20th, I am going to offer us a chance to do something. To be compassionate. To take action. To be a little ripple of hope in a great ocean of hurt. We humans need each other. Desperately. I’ve followed a couple of blogs where it seems every other post is the blogger asking for money to keep their site running. I’ve followed a couple of blogs where it seems every other post is an author reminding you of their book – it’s on sale this week! I don’t want to do that to you, dear reader. I don’t want to fill your Reader with requests for your money. But more than that I want to fill your Reader will amazing stories of lives being changed and dignity being restored and bellies and hearts being filled. Because those things are happening in the big world, too. So I’ve decided to make pointing toward the good work that God is doing a monthly thing. And I’ve decided to invite you, dear readers, to partner in that work. Even if you’re not into God and not sure He exists (or even if you’re absolutely sure He doesn’t), the best thing about good, restorative, life-changing work is that we can do it together. Every month, on the 20th, I will introduce us to something God is doing somewhere and invite us to be a part of that work. This first call to action is fairly selfish, but I have to start somewhere. I wrote about my church’s trip to Peru a few months ago. Now the trip is just over 100 days away and many of the team members are not even half way to the goal of $1,500 per person. We’ve started a Go Fund Me and are asking for help. (We are also doing a couple of fundraising events on the ground like selling homemade bread and organizing day trips.) But why should you give money to a bunch of people you don’t know to go to Peru for a week? Didn’t I (with the help of Alec Baldwin) convince you of the evils of short term missions last year? It provides Jesus followers in the Dominican Republic the eye-opening experience of witnessing what God is doing in Peru. We are on an island here and the isolation that comes with island living can lead to a great lack of awareness when it comes to our big world. Where is Peru? What is life like in Peru? What do they eat in Peru? Don’t they ride motorcycles everywhere in Peru like we do? Where are all the gua guas? Learning the answers to all of these questions first hand will greatly expand a Dominican church’s view of the world. A 10 day immersion experience will open up the floor to conversations on culture and diversity and why we do what we do how we do it – conversations I cannot wait to have. It was on my first mission trip to Mexico when I was eleven that God told me His plans for my life. Plans to prosper and not to – wait. Reflex. On my first short term trip, God told me, quite clearly, that I was to work with Spanish speaking children. Sometimes we have to get out of comfort zone (and out of country) to hear God speak in new, powerful, life changing ways. One of my criticisms of short term missions was the language barrier. Well, no such language barrier will exist here. Dominicans and Peruvians both speak Spanish! Each one of us on the Peru team are trusting God to provide for us financially to go on this trip. We trusted God when He asked us to sign up for the trip and we are expecting Him to be faithful, as He always has been. This is an exercise in trust for us. Learning to trust is important. 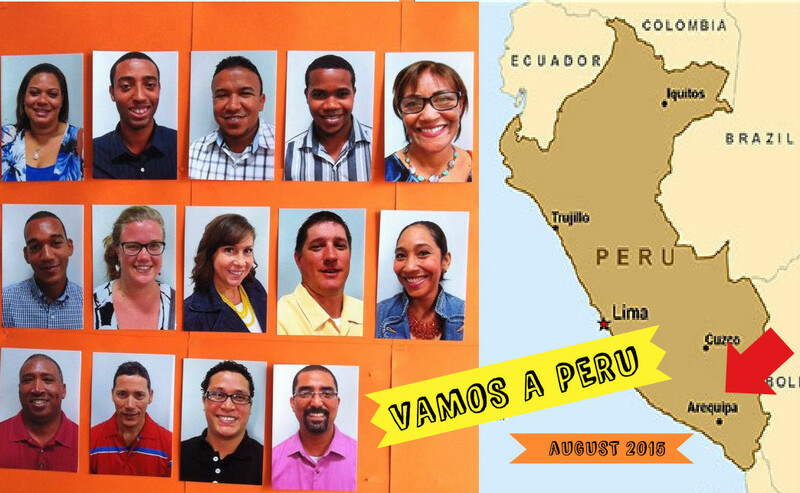 We want to serve the long term missionaries living in Peru. Because everyone on the trip either is a full time missionary or in close relationship with one or more full time missionaries, we understand exactly how much work hosting a short term team can be. Most of us going on the trip are part of the hard work of hosting a short term team multiple times throughout the year. We understand that the pastor we are visiting already has a full time job of relationships and bible study and sermon prep and budget discussions and meetings and decision making. We know because we’ve seen. We can approach this trip with a servant’s mindset because we know how wonderful it can be being on the receiving end of a short term team of servants. Missions are not just for North Americans. The first missionaries didn’t go anywhere near North America, let alone start out there. The southern church (southern hemisphere, that is) is growing like crazy. We are a part of that and that is worth celebrating and witnessing. Please consider partnering with us in the Dominican Republic and in Peru. Maybe God isn’t asking you to go to Peru. Maybe God hasn’t asked you to move to a foreign country and talk about Him in your second language. (Then again, maybe He has.) But maybe, just maybe, your Go-ing is going next door and down the street and around the corner and maybe, just maybe, that means you have a little extra Go-power to help us out as we go next door, down the street, around the corner, and to South America. *IBEM’s trip to Peru’s Donate button will be on the blog’s sidebar (over there under all the other stuff) until May 20, when it will be replaced by our next reminder of hope.